Empire Pacific Investigative Services, Inc. was recently recognized as a 2018 Top Client Rated Beverly Hills Contractor by Find Local Contractors. This award is based on the number of superior online reviews from their actual clients this year. We realize that our clients are entrusting us with very serious matters, and we are honored to know they are satisfied with our services, says an EPIS spokesperson. Empire Pacific Investigative Services, Inc. (EPIS) is a Beverly Hills based investigative and consulting service for a wide range of domestic and corporate cases. Their superior outcomes and commitment to uphold honest and ethical standards in their services has contributed to the numerous outstanding online reviews from their clients. Find Local Contractors recognizes this elite feedback from their clients this year and has awarded them as a 2018 Top Client Rated Beverly Hills Contractor. Find Local Contractors is an accessible and reliable online directory that helps consumers find the most qualified and highly ranked contractors in their area. The directory features company profiles along with links to multiple customer review sources. This is not the first time that EPIS has earned this award for their five-star ratings as a Beverly Hills private investigator. EPIS was founded by three retired U. S. Federal Special Agents in 1993. Today, the private investigative team brings over three decades of combined experience and diverse training in their field, allowing them to offer comprehensive services at both the state and federal level. Services span from background screenings and insurance fraud to computer forensics, infidelity and much more. EPIS also brings an unrivaled skillset in surveillance, which can be critical in cases involving child custody case, missing persons and infidelity. Beyond domestic cases, Empire Pacific Investigative Services also aids Beverly Hills’ businesses in detecting fraud and employee theft. They adhere to the highest standards of confidentiality in all cases. “We realize that our clients are entrusting us with very serious matters, and we are honored to know they are satisfied with our services,” says an EPIS spokesperson. Empire Pacific Investigative Services is bonded and licensed to perform private investigating in the state of California, but their services also extend worldwide to include clients in Asia and Australia. 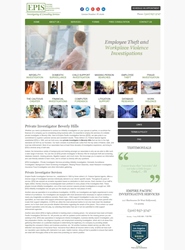 EPIS offers free consultations for services in infidelity investigation, domestic surveillance, child support investigation, missing person searches, employee theft and fraud investigation. To learn more about Empire Pacific Investigative Services, Inc., please visit ww.epis.us or call (310) 657-3747.